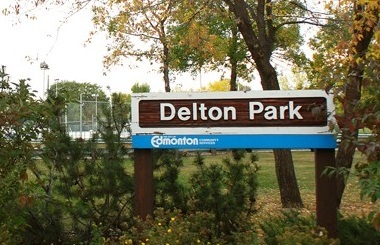 Delton was annexed to Edmonton in 1910 and was expanding quickly and subdividing land for future development. Upon annexation, Delton was over a mile from the nearest settled subdivision and just south of the old Grand Trunk Pacific Railway and was subdivided with a grid pattern of streets, common before WWI, even though most developments didn't occur until after WWII. The commercial development within the Delton area runs along 97th Street with the majority of houses being single-detached homes. Though Delton, bounded on the west and north by major roadways, its interior streets are quiet. The Delton Park and Delton Community Hall in the Northeast portion of the neighborhood on 123rd Avenue. Delton, named after Edmonton businessman and former alderman Edmund Del Grierson, who came to Edmonton in the 1980s while working on the Canadian Pacific railway and went on to acquire property along Jasper Avenue, including the Alberta Hotel (which no longer exists). Delton real estate is bordered North by Yellowhead Trail, East by 86 Street, South by 122 Avenue, and West by 97 Street. Displayed below are homes for sale in Delton, a subdivision located in Central Edmonton. For more information regarding any of the Delton Real Estate listings, click the "Request More Info" button located on the detail page of each property.